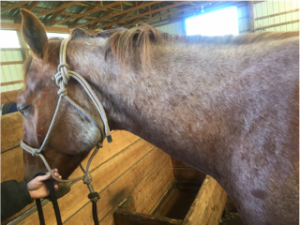 This case report outlines acupuncture treatment of a 6 year old quarter horse gelding who sustained a traumatic injury to his head and subsequently developed severe atrophy of the left masseter muscle. Acupuncture was performed on three occasions for the treatment of masseteric nerve degeneration. Treatments began two months after the traumatic incident and were performed approximately two weeks apart. GB 21, Bai Hui, ST 7, TH 17, ST 6, BL 10, TH 17, TH 18 and SI 16 were treated each time and massage of taut bands in his neck was also performed. E-stim was used for the second two treatments. Dramatic improvement was noted after each treatment and the horse’s masseter muscle had returned to about 80% of normal at the time of the final treatment. 6 year old quarter horse gelding who is used for Team Roping presented on May 1, 2017 for an examination and potential acupuncture treatment. Approximately 2 months prior to presentation the horse was found to have trapped his head in a gate. About 2-3 weeks after the incident, owners noticed that he had lost his masseter muscle on the left side almost entirely and he was maintaining his weight well. He has no previous medical history or history of any traumas and had not been treated previously by a veterinarian for any maintenance (dental, etc.). At the time of presentation the horse appeared to be eating and drinking normally and no abnormal behaviors had been noted. Physical examination was within normal limits other than notable generalized atrophy of masseter muscle on the left side. Only a very thin layer of muscle and subcutaneous tissue could be palpated just over the bone. Body condition score was a 4/9. Cranial nerve function was evaluated and all nerves appeared to be functioning normally. Specifically, ability to prehend food, symmetry of the lips and ears and eyelid function were all specifically evaluated due to concern for fascial nerve paralysis. All findings were unremarkable. Myofascial examination revealed firm and prominent taut (hypertonic) bands in the cranial aspects of the sternocephalicus +/- brachiocephalicus muscles on either side of the neck but more prominent on the left side. All other findings were within normal limits. The horse was responsive in the palpation of these regions and was wanting to be massaged in the area. A dental examination was performed under sedation following examination. There appeared to be mild restriction in opening of the speculum on the left side. The speculum was opened only minimally in order to perform the examination and a dental float. Mildly sharp singulae were noted on all arcades, along with mild ramps on 3011 and 4011 and very small chips out of 102 and 404. Following examination it was determined that acupuncture would be a reasonable treatment for this horse in order to hopefully re-stimulate (neuromodulate) the peripheral nerves that were likely damaged to have resulted in atrophy of the masseter muscle. Acupuncture and massage would also be reasonable treatments for the myofascial tension in order to try to alter fibroblast activity and relieve connective tissue tension. It was outlined to the owner that a series of treatments would be recommended before it would be expected to see any notable outcome from treatment with acupuncture. Mandibular nerve degeneration – It was determined to be more likely that a branch of the mandibular nerve was involved rather than the entire mandibular nerve since the tongue, salivation and sensation did not appear to be affected. Trigeminal nerve degeneration – Once again, further abnormalities were not noted that would be likely if damage of the more proximal trigeminal nerve “root” had been damaged and the depth of the nerve would also make it more likely that further damage and other nerves would likely to have been affected as well. Masseter (nutritional) myodegeneration due to vitamin E/selenium deficiency – Unlikely due to the horse only being affected unilaterally and the owner’s having witnessed a traumatic event. • Began with GB 21 bilaterally and Bai Hui as relaxation points as the horse was beginning to wake up from xylazine and butorphanol sedation that was used for dental float. 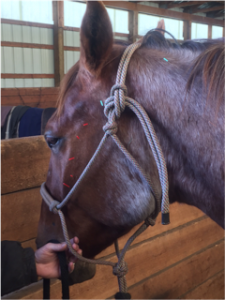 Because the main treatment area and the above points were all located on the head, and not knowing how the horse would respond, dry needling was the only method chosen for the first treatment. The horse was very relaxed with the placement of needles and did not shake or move enough to make me feel as though e-stim would not be possible on subsequent treatments. Therefore, with the following two treatments e-stim was used to hopefully allow for more significant neuromodulation and stimulation to encourage the muscle in the area to redevelop. The leads were placed with the more proximal lead being along the bigger nerve branches and the distal leads were moved between needles that were placed in the belly of the masseter muscle. The leads were moved about every 5-10 minutes and were operated at a low intensity (1-2 on the ITO unit) and low frequency. The taut bands in the sternocephalicus and braciocephalicus were massaged during treatment. The horse was very responsive to the massage and there was a notable difference in the tension in the region after about 10-15 minutes of massage was performed. At the time of the second treatment the masseter muscle was determined to be noticeably thickened by the owner, as well as myself. We were no longer able to easily palpate the bone through the skin and thin layer of muscle. There was still dramatic asymmetry compared to the contralateral side, but it was felt that rather than progressive worsening in masseter muscle mass that had been noticed in the months prior to acupuncture, the muscle was starting to improve. The musculature of the neck was even more dramatically improved at the time of the second treatment, with only minimal taut bands noted at that time. At a similar time to the first acupuncture treatment, the horse was placed on a new feed program whereby he was given a grain supplement twice per day. His weight improved dramatically at the time of the second treatment and his hair coat was noticeably shinier. At the time of the third treatment, it was debated whether or not the treatment was even necessary as the improvement was so dramatic. The horse’s masseter muscle almost appeared normal but when compared to the other side was probably only about 85% of the size. Myofascial examination of the rest of the horse was unremarkable. This case taught me about the dramatic potential that acupuncture has to re-ignite nerves and stimulate a region of the body to begin to repair itself after many months of it not improving on its own. I was pleasantly surprised by the short time period with which this occurred as well. This case also reminded me to always evaluate the entire patient for any compensatory or related myofascial pain. The horse was extremely responsive to massage of his neck and it became the most enjoyable portion of the treatment for him. In this case, I believe that most of his discomfort was not from the local injury itself, but rather from what his body had begun to do to compensate for it.